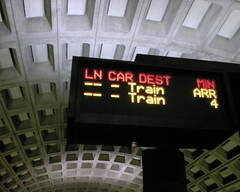 At the darkest hour of Metro’s current crisis footing, four new members are coming to the Metro Board, all from the Federal sector. Metro will seat the first two before this week’s board meeting to determine budget direction and to help provide guidance before the budget gap is closed. Those two members are Mortimer L. Downey and Marcel C. Costa. Why are they just coming onboard now? In response to the disaster this summer, and the increased funding coming from the Department of Transportation, Rep. Gerry Connolly (D-Fairfax) said, “If the federal government is going to be kicking in $150 million a year, it deserves voting representation on the board,” which is a pretty solid point to make. The four members (two directors, two alternates) will join the board without the veto power that each of the twelve jurisdictional members possess. Yep, I think that’s a bare minimum to demand from our transportation system right now.